It's hard to believe that a walking boot that's over 15 years old is still as popular today as it was in 1993. I am of course talking about the Brasher Hillmaster, the walking boot that has symbolised Great Britain's love for traditional brown walking boots. Before we get to the nitty gritty about the Brasher Hillmaster itself, first a little history about Brasher. Founded in the late 1970s by 1956 Olympic gold medallist Chris Brasher, it was only after he was half way through a 180 mile hike in Wales than the former Olympian took off his hiking shoes to reveal a plethora of painful blisters. In order to continue the rest of the trek he put on his New Balance training shoes and continued the journey in well cushioned comfort. Having thought about this long and hard for the rest of the trek, he reached the end, exclaiming "If only my walking boots were as comfortable as my training shoes!" And with that Chris Brasher hit upon an idea. The idea, which led Brasher shoes to become a worldwide success and the best selling British outdoor brand of all time, was to combine the traditional good looks and support of a rugged walking boot with all the comfort and cushioning of an athletic trainer. In 1993, the Brasher Hillmaster GTX totally revolutionised the world of walking boots. It's important to remember that during this time walking boots were made from heavy leather with rigid steel shanks and they became even heavier when wet. Suddenly there was the first lightweight walking boot, which was not only highly durable, but featured the Gore-Tex membrane, making it windproof, waterproof and completely breathable. As you can imagine, this made a mockery of the traditional walking boot designs and earned the Brasher Hillmaster an almost fanatical following in the walking community. Today, the Hillmaster GTX is an outstanding example of what a walking boot should be and still outclasses many of the modern outdoor shoes when it comes to comfort, classic good looks, waterproof proof protection and rugged durability. Outdoor enthusiasts continue to praise the boot to this day with the Brasher Hillmaster GTX winning "Best Leather Boot" in Country Walking magazine for more than 6 years running. But does the boot live up to its reputation? The Brasher Hillmaster GTX is a traditionally good looking brown walking boot which is marketed to be lightweight, hard wearing and comfortable straight out of the box. It has to be said that the Hillmaster seems quite narrow at first, but once your foot is in the boot, the full leather interior lining feels very comfortable. They still require some breaking in, but not much. The full grain leather is very rich, making the Hillmaster a handsome boot with a deep muddy brown colour which has been a favourite of British walkers for as long as anyone can remember. The biggest selling point, besides the Hillmaster's history and good looks is the Gore-Tex lining. Gore-Tex is 100% windproof, waterproof and fully breathable, making it the perfect addition for any walking boot. Designed for hillwalking and easy trekking, the Brasher Hillmaster also features a deep-cleated sole unit for crossing softer terrain than hard and rocky paths. While this makes the Hillmaster less versatile than other walking boots, it is exceptionally good in this specialised role. Best suited to the softer ground of the Dales, Beacons or Dartmoor, the Brasher Hillmaster GTX weighs 1,440g. So while it may not be the lightest walking boot, it is still very good for its price point and remains a good looking, lightweight and hard wearing boot for outdoor pursuits, hill walking, walking holidays and light trekking. It's been 15 years since the launch of the Hillmaster GTX and even today it is still the best selling style in the latest 2009 Brasher range, beating all comers whether its Brasher's latest walking boots and familiar favourites or the walking boots from other leading outdoor brands. So the Brasher Hillmaster is not only a symbol of traditional British walking, but a good looking, fine quality example of outdoor footwear that ticks all the essential boxes and offers great performance at a true value price. In many ways it's a shame that Brasher never boast about their technologies and features in the same way that other walking boot manufacturers do. But with the Hillmaster, perhaps it's testament to how Brasher as a shoe manufacturer keeps things simple while maintaining the high quality of their products. The Brasher Hillmaster GTX has had rave reviews for many years and it's clear to see why. 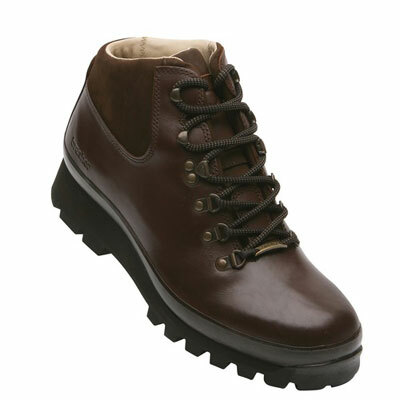 So if you are considering a walking boot for softer ground, the Brasher Hillmaster should always be the first boot you try on.